My new normal is far more relaxed than a year ago when I worked in an office. I go to the gym, take my daughter to school, run a few errands, and then hunker down at my computer for 6-9 hours. If I do go out, it's usually a fashion or blogger event and the look is less office style and more street style. Many days, my life is in a stretchy pair of jeans and a top, but I make sure to choose pieces that are not only comfortable but have subtle details to elevate them and add style and interest. I'm not a fan of stiff button-front shirts, I find them hard to wear when you're curvy and soft. But Universal Standard knows how to dress a soft curvy body so I was willing to try their Elbe Shirt. Like everything from Universal Standard, the fabric is phenomenal and completely justifies the cost ($80). It's stretchy but still has crispness; a sheen without looking cheesy. The buttons aren't white but a more subtle horn/tortoise shell color and the placket is covered. This is a popover with a placket that ends halfway down the shirt. This is awesome because you don't have to worry about it getting wonky when tucked in or gaping when you sit down. The collar is the perfect amount of stiffness and height to look great as-is, but can also look great if popped. The cuffs have three buttons: two at the cuff and one higher up to keep it from gaping. All this and it's machine washable. This shirt may have made me a button-front shirt convert! I've had luck with Talbots denim in the past. 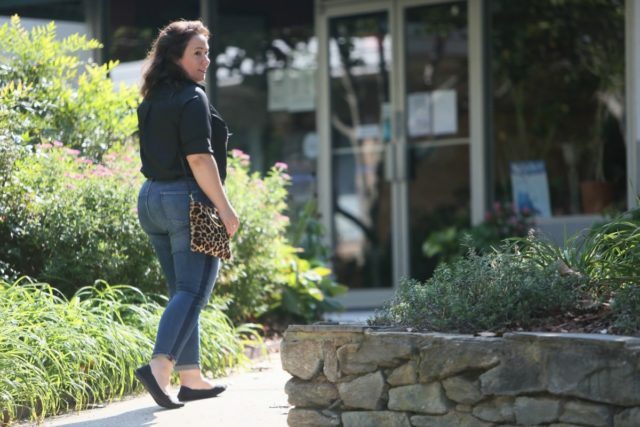 They are a nice weight, don't lose their stretch, and hold up beautifully (I have some bootcut that are three years old that each time I go in my denim drawer I grab them mistaking them for a brand new pair). 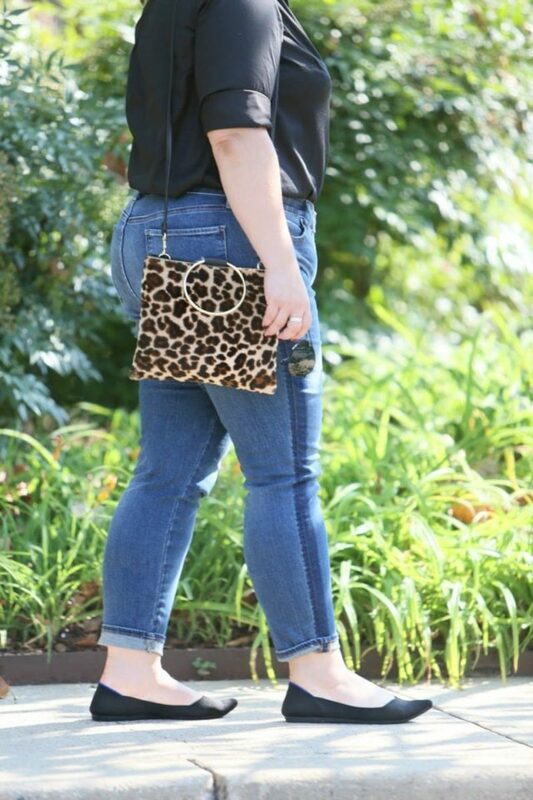 I loved the subtle shadow stripe on the seam of these jeans. It's subtle, but adds style while also elongating the leg. I wore these jeans Friday night to a carnival and they held up in heat and humidity as I climbed in and out of rides, sat on grass, and in general gave them a workout. Threw them in the wash and dryer with other jeans and they came out looking and fitting exactly the same. 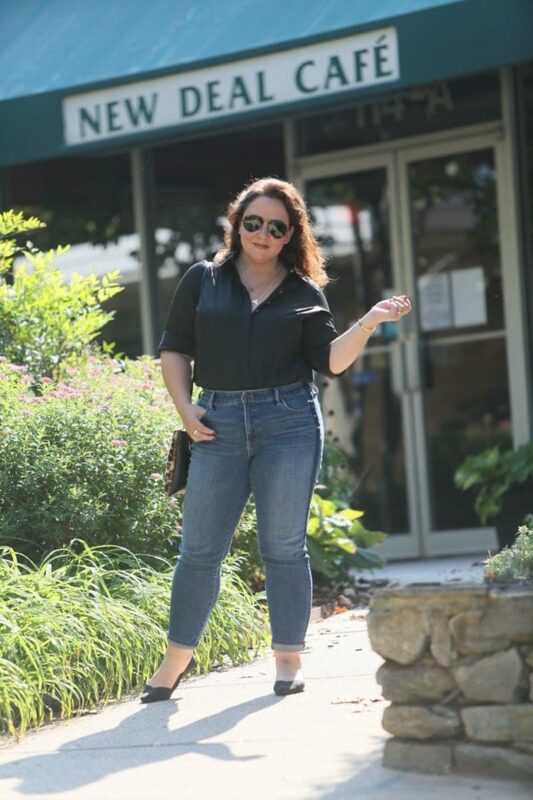 I wore these jeans for over 12 hours Tuesday, running errands, taking my kid to school, and even sitting for hours in my home office writing this post and answering emails and comments. No sliding down, no stretched out waist or knees, and super comfortable. If unsure, size down. Even with petite these have a very high rise and I find a small cuff is needed to have them truly an ankle length. This is the same bag I featured Tuesday, this time with the optional shoulder strap. The bag may look small but in there is my full-sized wallet, my Ray-Ban sunglasses case, my phone, and a small pouch with tiny hairbrush, lip balm, eye drops, and lip gloss (I'm wearing Fenty Gloss Bomb and it's amazing). 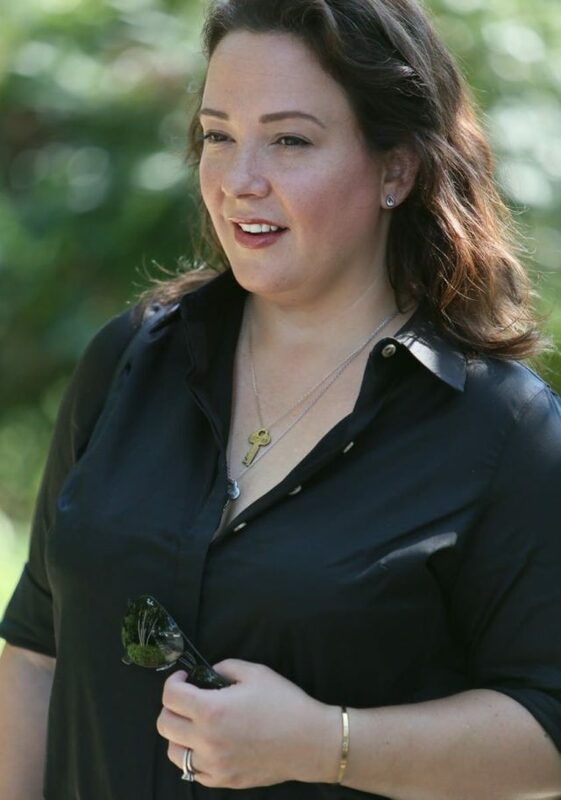 The necklace is from a collaboration with The Giving Keys and cabi. Each season, cabi creates a piece where a portion of the net proceeds from helps fund their The Heart of cabi Foundation’s efforts around the world. This year it is this necklace. It's two necklaces, connected by a ring in the back. The necklace is also adjustable in length. Wear the two keys together, separately, or give one as a gift to a loved one. One key has the word “Better” on it, the other “Together.” “Better Together” is the theme for cabi's Fall 2018 collection; it's a message of hope and strength that cabi hopes everyone will carry forward into their lives. At first glance, this outfit is pretty basic. But when you look closer, you see the subtle details that makes it stand out and honestly, makes it more enjoyable to wear! These photos were taken outside the New Deal Cafe in Greenbelt, Maryland. If you follow me on Instagram you know this is a favorite place for me and my family. Rated one of the best small live music venues in the US, the Cafe offers live music almost every night of the week and there is no cover. This summer, the kitchen was taken over by Michael and Leah Moon, who also run DC Vegan Catering. The new menu is Italian-American and completely plant-based. Even the wine and beer offerings at the Cafe are vegan. The food is amazing, enjoyed by vegans and omnivores alike (my personal favorites are the Panzanella and the Chesapeake). 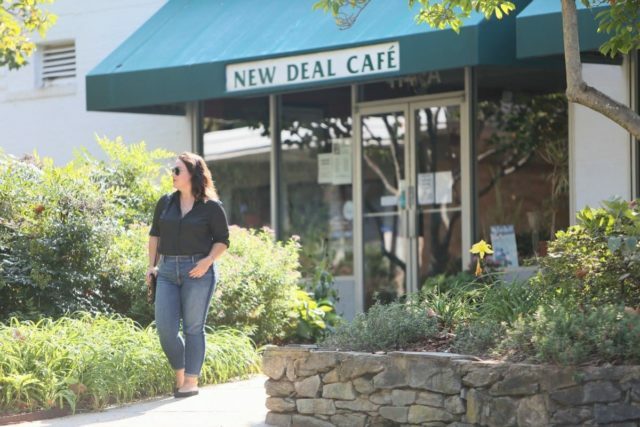 Like many businesses in historic Old Greenbelt, The New Deal Cafe is a non-stock, cooperative membership corporation. Wow Ally, these jeans fit you marvellously well- all are great fitting basics. Nicely done. I’ve been enjoying your blog for years and I have learned so much about style from your posts! You look fresher and even prettier now that you are more in charge of your schedule. GOOD FOR YOU! This particular outfit looks great on you. I wish that more shirt designers paid attention to important details like not gaping and having tails long enough to stay tucked. Even though I am not curvy, I run into the same problems with shirts that you do. Just here to second your thumbs up on the Elbe shirt. I wear my Universal Standard Elbe shirts to death. Same with the Rubicon dress. And as someone with a larger chest than I’d prefer to have, popovers are great because you can sew the buttons shut if you need to and never have a gap. Great suggestion thank you Barbara! I just have to say, your booty is popping in those jeans! You look so effortlessly chic in that outfit! Love everything about it. Thx so much for yr support of the New Deal. It’s the heart of the community and I’m so glad u love it too.